Quincy Jones has transcended his one-time occupation as a film composer through his diverse pursuits in jazz, film and media—he is a bona fide celebrity and one of the most important personalities in popular music. So it is only natural that his impact on film is often overlooked—but in the late 1960s and early ’70s, he was one of the hottest composers going, with a jazzy and modern style that elevated such important pictures as The Pawnbroker, In Cold Blood and In the Heat of the Night, and also worked wonderfully on lesser-known and genre projects. 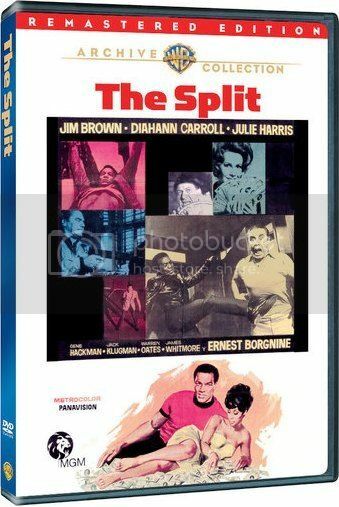 One such film was The Split (1968), like Point Blank (FSMCD Vol. 5, No. 8) an M-G-M adaptation of a Richard Stark “Parker” book—here The Seventh—but without the arty aspirations. Jim Brown stars as “McClain,” who leads a ragtag group of underworld thugs (including Ernest Borgnine, Jack Klugman, Warren Oates and Donald Sutherland) in a robbery of the L.A. Coliseum during an NFL game—but while the caper goes as planned, dividing the proceeds up afterwards leads to bloodshed and strife. Gene Hackman appears late in the film in a pivotal role as a detective. Quincy Jones was famously the first African-American composer to have a major career in the previously lily-white world of film scoring—and remarkably resisted typecasting inasmuch as he scored many important films where race was a non-factor. Still, urban settings (with their racial implications) brought out some of his most dynamic work, and The Split is a pulsating, funky and tuneful score with a riveting array of jazz and modernist effects. It is Jones in full-fledged They Call Me MISTER Tibbs! territory—angular, funky and irresistible, with several vocal source and score cues to boot. FSM’s premiere CD of the complete score to The Split is mastered from the original ½” three-track stereo masters for excellent sound quality. The copious liner notes by Scott Bettencourt and Alexander Kaplan give a thorough background on the literary world of Richard Stark (a pseudonym for Donald E. Westlake) and this film adaptation.